Many amateurs are experimenting with various digital voice modes, such as Yaesu System Fusion C4FM, D-STAR and DMR etc, mostly on the VHF and UHF bands. Did you know, however that there is also a digital voice mode for HF radio operation that was specifically designed by amateur radio experimenters? FreeDV, based on a fully open source codec known as Codec2, has been created by David Rowe VK5DGR in collaboration with a team spread across the globe. 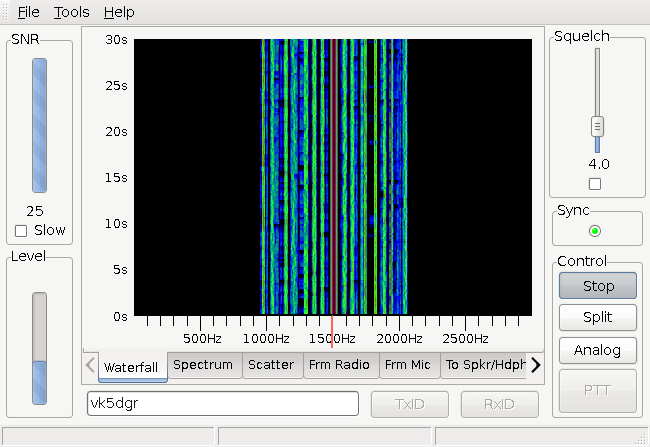 FreeDV is enabling amateur radio enthusiasts to experiment with new open source digital based voice transmission techniques on the High Frequency (HF) bands. While text based HF digital modes are common, FreeDV is the first new VOICE mode for HF since SSB was introduced in the 1950s and 60s. Over the past 18 months or more, David and his team have been busy working to improve the lower bit rate versions of FreeDV. The original system, released as FreeDV 1600, was based on a 1600bits/sec data stream, but was a few dB off being equal with SSB. Now, David is pleased to announce that the new FreeDV 700D mode is ready for wider trials.This new version uses a 700 bit/s speech voice codec, powerful forward error correction, and a new modem to send digital speech over HF radios. What is really exciting however is that testing of FreeDV 700D has demonstrated that it is outperforming SSB on poor channels! Here is a demo of SSB, followed by FreeDV 700D, on a poor quality 3,200 km path between Adelaide and the Bay of Islands, in New Zealand. You can run FreeDV using any PC set up for digital modes, using the FreeDV 1.3 GUI program, which you can download from freedv.org. Where can I find FreeDV activity? So why not try the new FreeDV 700D mode, and join us in experimenting with it on the HF bands! AREG wishes to advise that the FreeDV HF digital voice WIA Broadcast relay will not be run this week due to the team being fully engaged with the Horus balloon flight. Service should resume next week at 10am ACST on 7177kHz. The AREG (VK5ARG) is continuing to conduct an experimental re-transmissions of the National and VK5 WIA News Service in the FreeDV-1600 mode on Sunday mornings. The aim is to encourage amateur radio operators to come and try FreeDV HF Digital voice. Due to HF radio propagation conditions over the past few months, the team running the relay has decided to try relaying the broadcast an hour later at 1000 CST (0030 UTC) instead of the earlier 0900hrs time. This is so that there is a better chance of skywave propagation being available into VK5 as well as VK3. Callbacks are conducted after the broadcast providing an ideal opportunity for you to experiment further with FreeDV! Callbacks are conducted in FreeDV mode initially, and SSB at the close (to allow SWL stations to provide their reports also). Online logging of FreeDV has been disabled for the time being due to a problem with the website. To continue promotion of the FreeDV mode, the AREG this coming Sunday is planning to attempt a relay of thethe WIA news using the FreeDV 1600 mode on 40m. The operating frequency will be around 7.177 from 9am CDST (2230UTC) with a FreeDV 1600 net Planed around 9:30am (2300UTC). A FreeDV 700B net will follow after the 1600 mode one. Andy VK5AKH will be transmitting the WIA Broadcast and acting as net control. He will monitor the FreeDV QSO finder, IRC etc for feedback during the broadcast. If the worst case arises and we can’t get the Broadcast working there will still be an on air gathering at 2300UTC of FreeDV stations. Andy runs a rotary dipole and would expect that 50W of freeDV should reach most of SE Australia fairly well at this time of the day, so tune in and have a go!